What Is "About:blank" and How Do I Get Rid of It? - Ask Leo! “about:blank” is a blank page built in to your web browser. “about:blank” is displayed when the browser has nothing else to display. “about:blank” is not malware, but it can result from malware being present or having been removed. You can use “about:blank” as a fast browser homepage if you like. About:blank isn’t really “about” anything. The word “about:” is a keyword some browsers use as a way to enable some functionality or display standard pages. You can read more about “about:” in this Wikipedia article. About:blank displays a blank page. That’s it; about:blank is nothing more and nothing less than a blank page built in to your browser. Most browsers have to display something in the browser window, and Internet Explorer is no different. If IE can’t figure out anything else to display, it displays about:blank. The problem is, IE can choose to display about:blank because of malware. Again, about:blank is not malware; at worst, it’s a symptom of malware. Malware sometimes breaks things, and IE becomes unable to display a page, in which case it displays about:blank. The solution in these cases is to run up-to-date scans for malware. Since malware can break your browser and leave it in a confused or broken state, it can be left in such a state after malware is removed. What that means is that the process of removing malware might cause the browser to become confused. Perhaps it was displaying a page provided by the malware which, once removed, leaves the browser nothing to display. The result is, you guessed it, about:blank. The solution is simple: change your homepage back to what you want it to be. Your browser homepage is the page you see when you first run the browser or hit the “Home” button. Frequently, the default home page for Internet Explorer is set at msn.com or some other Microsoft-related property. You can set the homepage to be whatever you like. “About:blank” is one option, specifically because since there’s nothing to display — it’s a blank page, after all — it’s displayed very quickly. Click on the gear icon in the upper right of Internet Explorer, and then click on Internet options in the menu that results. 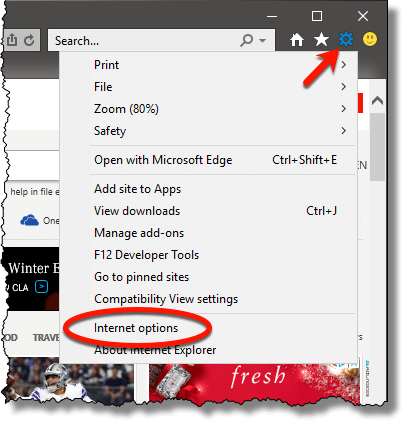 Internet options menu in Internet Explorer. The resulting Internet Options dialog will open to the “General” tab, which has a section labeled “Home page”. General tab of the Internet options dialog box. 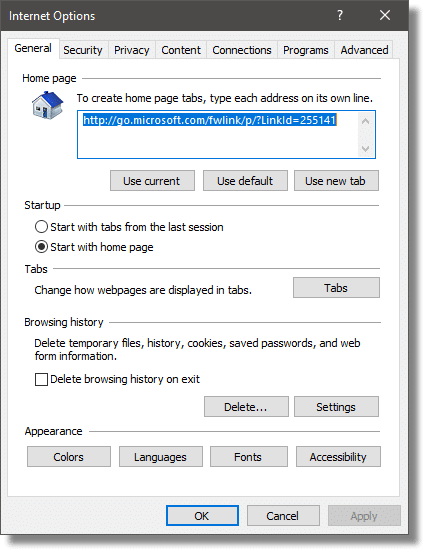 As in the example above, the default home page is a Microsoft URL. To change it to “about:blank”, click in the edit box containing the link, and replace it with “about:blank”. Homepage setting changed to about:blank. Click the OK button to close the dialog box and save the setting. Now, click the Home button in IE. The result? About:blank. Now your browser will (quickly) return to about:blank whenever you click the Home button and when you first open the browser. « Previous post: Is the Cloud Dangerous? I’ve started using the about:blank function as my opening page. Basically as a platform to launch from. Sometimes when my connection is slow for some reason, my computer hangs & I have a devil of a time closing the browser (firefox). If I click on the home page icon & it can’t get out to it, it seems easier to shut down & go kill a bit of time playing solitare until the problem clears up. I use a wireless provider and it seems that many things can cause it to mess up. I agree with Mike. About:Blank is an excellent starting point. Sometimes loading a page you don’t always want to read is counter-productive, especially if your monthly limit is on the low side or you’re paying by the kb. These days a lot of pages load Mb of ‘junk’ just because they can – flashy banners, video clips, etc etc – and unless you watch/read all of it, you are downloading data for no good reason. There is no way to ‘get rid of it’. It is written into the browser and has been for nearly twenty years. It looks odd but the term comes from the early days when more formal terms and structuring were prevalent (and DOS ruled as well). Most browsers as we know them came from or owe their existance to a program called MOSAIC, which you should do a search on. It might be heavy but it will probably fascinate you. Leo, Just a semi-off-topic comment. When your readers refer to themselves as “dumb,” what they might mean is: “There are two kinds of disciplined twenty-first-century technology users: first, the vast number of people dedicated to acquiring and exercising as much tech-knowledge as possible; and, second, those comparatively few blessed from birth, as you were, with innate understanding of principles of mathematics and other technology-related sciences.” Perhaps see it as a compliment, Mr. Teacher. That may be, but saying “I AM dumb” absolutely comes across as totally self-defeating. As I said, that wording totally turns me off. Nobody is truly ‘dumb’, they are only unfocused in one or more disciplines. Those with no actual working knowledge of a concept often contribute to the solution of very vexing problems to those who have studied it hard. Or, to put it in a different way, grace is not learned, it is found. There is an old saying “The difference between stupidity and ignorance is that ignorance can be fixed”. I suspect that the “I am dumb” comments are probably intending to say “I am ignorant” and (since they are asking about it) want to fix it for this topic. All people are ignorant of most knowledge in the world. Do I know the derivation of the Sanskrit language? I am totally ignorant about it but that could be fixed if I had the desire to know it. Bill F, your comment relates to another old saying: “You can’t fix stupid”. While that may be true, and as you rightly pointed out, you can indeed fix ignorance if you are willing to put some effort into it. For the about:blank as a home page people. Consider creating a minimalist web page with your most common links on it and saving it on your hard drive. You get the speed benifits of About:blank but also get your most common items with one click. I’m an IT Pro and I’ve always used “about:blank” on every computer I’ve ever set up and in all my years of computing it never occurred to me to investigate if “about:” had additional functionality. Because of your question and because of Leo’s answer, I’ve learned something. We’re all learning. Thanks Leo for correcting me. I should have said that I lacked the knowledge to understand instead of taking the ‘short form’. You and the guys above have set me straight again. However I did it one of the best things I ever did was subscribe for your newsletter. This about:blank web page reminds me of the Opera web browser which has a home page of links. You can’t sign out of the browser by x’ing out a tab. you get this links page. you have to alt-x to close the browser. It’s easy to sign out of other browsers by mistake. Interesting: Steven’s comment reminded me that Internet Explorer used to acknowledge its origins in MOSAIC. Out of curiosity, I downloaded MOSAIC from the NCSA website and tried it. It hasn’t been updated since 1997, so perhaps unsurprisingly I failed to access any websites with it; the interface is reminiscent of Office 2000. I, too, always use “about:blank” as my home page. I started that after being issued my first laptop, long before wireless was everywhere. When I had an actual webpage as my home page, e.g. Google, and was not connected the browser would hang for a long time, and I am impatient. Also, when learning that many websites track where you go when you leave their site I began the practice of clicking the “home” icon and then navigating to my new destination. I felt that going from a retailers site to a baseball score site was information about me they really didn’t need to have. I have my Internet Explorer load to a blank page on purpose. I don’t want or need a home page so it’s my default home page. Loading a page with lots of graphics takes a long time on an old computer, so that’s why I do it, but also I don’t need that home page and can choose where I want to go once the internet is up and running. To get rid of it, just choose a home page. In my case,I think about blank is one of Microsoft home page.about blank shows for less than a second on starting my Home page (google).My Home page in Internet options never changes it’s always google. This you did not explain in your article. I love about blank, when I fire up my PC I sure as heck don’t need nor want to see a bunch of kooky info from the get-go. As an example, If I want to find my weather info I’ll look it up myself. You might want to get that IT son to take a look at your computer for malware. Things shouldn’t be changing like that on it! I ABSOLUTELY HATE ABOUT:BLANK. I have had nothing but problems with that darn thing. Everytime I get rid of it, it pops up again. Isn’t there something out there that completely gets rid of it???? PLEASE??? All is not that easy with ABOUT BLANK because i once had a problem with it where i couldn’t get rid of it and then relished there’s also a virus with the name of ABOUT BLANK. After i removed the virus all was then ok again. I used to have MSN as my home page. The page was all very interesting, and offered quite a few things to read – thus I was waylaid from what I had intended to do. I can’t remember why or how I had that page. One day I decided to get rid of it; in wanting nothing showing on the home page I got “about: blank”. Very good! No distractions!! yes I ve set google as my home page and checked it about a hundred times and yes internet explorer opens to google. however, when I click on a new tab on the google page to open up ANOTHER page- I get about:blank. so how can you change that so that each page you open thereafter is also google??? I’m not sure that’s possible, but if you open a blank page and type your search question in the address bar, it will Google, or whatever search engine you use, it for you from there. No need to open the Google home page each time. I had no problem getting rid of about: blank. I have a program named “Hijack this.” I ran the program, found about: blank on the scan of the program and deleted it. done! I do not know if HiJack This is still around but I do have the program and will send it to anyone who needs it. Here’s the link to Hijack this. Be sure to click where it say Download@MajorGeeks which is right under Download Locations. All other links and buttons are ads. Just read your article on about: blank, and how you got rid of it. We’ve got it too. Not obviously a problem, but I do wonder if its browser monitoring function does compromise the PC’s security. Also, is it involved somehow in junk e mails? Could you be very kind and forward the link to ‘hijack this’. It’s not monitoring your computer. It has nothing to do with spam. It’s just the result of your computer being slow. As Leo explains it is just your browser loading nothing. Not quite true that about:blank is benign and not something to be removed. It is a huge annoyance and prohibits me from doing quite ordinary things. Today for example, I wanted to place a small order with Amazon. Went well right up to proceeding to checkout. The about:blank window popped up; I clicked it off (I thought) and again tried to proceed to Amazon checkout; tried many times; could not find the answer. And surely there MUST be a straight answer. — I’ve been using computers for 40+ years. Now elderly and losing my patience quicker; refuse to read tomes of nonsense just to get to what should be a simply solution. I did not ask for this, don’t want it, need it to go away. Thanks. about:blank just means the page hasn’t loaded yet. So every time you click it off you click off the page you are trying to load. It’s, like, the default page – the first thing the browser displays when going to a page. People with fast computers won’t see it at all because it flashes past so fast. So the only thing that is happening is that your computer or internet connection is slow. It’s not a virus or anything like that. The trouble I have has not been addressed! I know it’s a benign blank page, the trouble is that the words “about:blank” will not leave the address field when I attempt to enter a website address! That is bloody infuriating! The address filed should quite literally be left blank, that is, completely empty so that it may receive an address entry by the user. Some twit from the past thought it was necessary to announce to the world that the page is blnak, rather than just let us observe that, yes, it is indeed actually blank! Furthermore, Google, MS, Maxthon, et. al should provide an option to leave the ADDRESS FIELD EMPTY if we choose to have NO home page, what could be simpler than that? I continue to be bemused by the idiocy inherent in the IT industry, no one in it seems to have any practical sense! about:blank is a bloody nuisance I have had this install itself twice on my PC and have tried about 4 of the top anti-malware programs to get rid of it and all to no avail. It generally shows itself through a program that you may have recently downloaded. Ironically about:blank had attached itself to the very anti-malware/anti-virus program that I thought could get rid of it. I applied the same method that I found previously successful by uninstalling the suspect program and then powerfully uninstalling the residue – it worked. Well worth a try. TROLLOLOL, it’s about:blank! This annoying thing has cause a lot of trouble. Some says it is extremely annoying and some says it is just a glitch in the web. But the truth about this horrid thing is something that if the computer has absolutely nothing else to display, it will show about:blank. Hope this is helpful!!! People, you just can’t get it, as Leo said blank is nothing. If someone asked you for a definition of “blank” what would you say? I would guess something like “nothing” and you would be right. Maybe it would be easier for you if you thought of it as a blank page which is exactly what it is and as soon as you write something in your address bar and enter it, it will no longer be blank because you have changed it to a Url (web page) or a search, etc. Starting to get it? You are in control and your action changes it to no longer be blank to something with content. That is the key, a blank page to one with content. That is my two cents worth, hope it helps. My Mac book doesn’t let me look anything up.. Its used and every time I look something up it sends me to a blank white page.. What does that mean? I’d have to know exactly what steps you take to “look things up”. What browser? What site are you trying to look things up on? Need LOTS more information. It’s now 2019 and there is no longer the scourge of about:blank. What was so vexing in 2012 has been eliminated by Trumpian fiat. Also, there is a new Microsoft browser called “Edge” that’s even lamer than IE and Chrome is still the best browser for ameliorating your about:blank woes. Since I use ‘Chrome’ as my browser, is there any premium in uninstalling Internet Explorer? Nope. It’s so tightly intertwined with Windows it’s actually quite difficult to do completely. More here: https://askleo.com/how-do-i-uninstall-and-reinstall-internet-explorer-in-windows-10/ – particularly in the section labeled “What you’re really uninstalling”. Thank you Leo, I’m aware it’s deeply embedded but, on Windows 7 professional, will any damage ensue from uninstalling as much as may be possible to find? It depends on how deep you dig. The answer is yes, if you delete components that are shared by other applications or Windows itself, then you will damage those applications or Windows. Honestly, it’s just not worth it. Thanks again Leo, I’ll keep my sticky fingers out then. If you do, keep an installer handy as you might need it. I’ve removed IE and it was not worth it, in that it caused problems with other browsers and programs and Windows. Some websites still — as backwards as it sounds — “prefer” IE but in reality that may be the only browser that works. Just ran into one of those two weeks ago in trying to complete a necessary online transaction. “Some websites still — as backwards as it sounds — “prefer” IE but in reality that may be the only browser that works.” That’s true. I used to have the hardest time doing online banking until I tried logging on with IE. Their website only works with IE and now Edge. And not to mention any names, it’s the largest bank in the US which can’t be bothered to get their website working on other browsers. Better than an installer is to take a system image backup before attempting any major work on your computer. Reinstalling Windows might cause a loss of data and/or installed programs. In this case, simply don’t try to remove IE. You would only gain an insignificant amount of disk space in the best case scenario. You’ve explained this so clearly for me. Once again, thanks so much for clearing up something that has always confused me. When I used dial-up internet in the previous millennium, I would always set my browser’s homepage to about:blank to prevent it from using more bandwidth. When high speed flat rate broadband access came out, I switched to using a news and weather website as my homepage. Some few years ago I had problems with about:blank. It hijacked my home page no matter how many times I re instated it. It may not be malware but Malwarebytes did stop it, though for a limited time (sometimes a few days). I stopped using IE 11 and moved to Chrome. No trouble since though I have seen it occasionally while waiting for a page to load. “It” did not hijack your home page. Some other malware or system problem did. about:blank is not malware. I occasionally get “about blank” on Chrome. I don’t worry about it. It seems to be relative to some defective link or links. I’m not sure, but I just move on. The latter word is sooo much more high toned sounding, so everyone uses it instead. Using simplistic instead of simply is not only high toned but completely wrong. Simplistic means over-simplified. 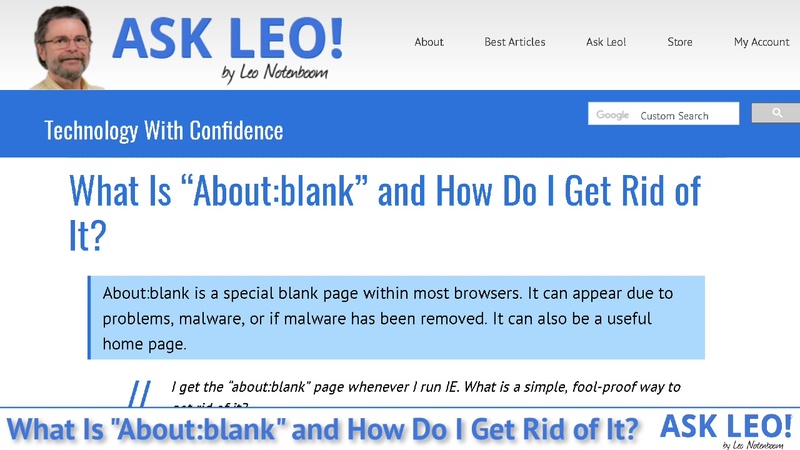 As many have pointed out and Leo states correctly, about:blank as your home page is NOT malware. It can indicate malware but is not anything else. Like it? Keep it?